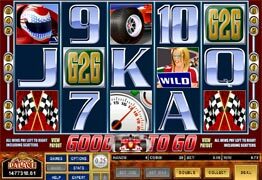 Good To Go is a five reel, 9 payline slot machine game. This game takes up to 90 coins. Good to Go has a wild symbol, which is the Pit Girl symbol. A scatter symbol, a Free Spins bonus game and a Gamble bonus game. You can play this game for Free or for Real Money at Spin Palace Casino with 99.13% payout on slot games and more than 100 casino games to choose from!